A self-proclaimed advocacy group that’s flooded the Valley with disability-access lawsuits is now claiming the majority of their cases don’t settle for money. A spokesperson for Advocates for Individuals with Disabilities (AID) made the claim in response to a series of ABC15 investigative reports. ABC15 has heard from dozens of business owners and spoken to multiple attorneys, who collectively represent hundreds of businesses in AID’s lawsuits. The owners and attorneys said that’s not accurate and doesn’t match their dealings with AID. AID has filed more than 1,500 lawsuits in Maricopa County since February. The group files lawsuits against businesses for alleged access violations in parking lots under the American with Disabilities Act. For example, in many cases, AID has sued businesses – and demanded thousands to settle -- because their parking signs were a few inches below the 60-inch requirement. Settlement agreements in AID’s lawsuits are confidential. But many businesses have told ABC15 how much money they paid to settle cases. The amounts can range from $3,000 to $7,500. UPDATE (8/19): AID has disputed that settlement demands reach that much. 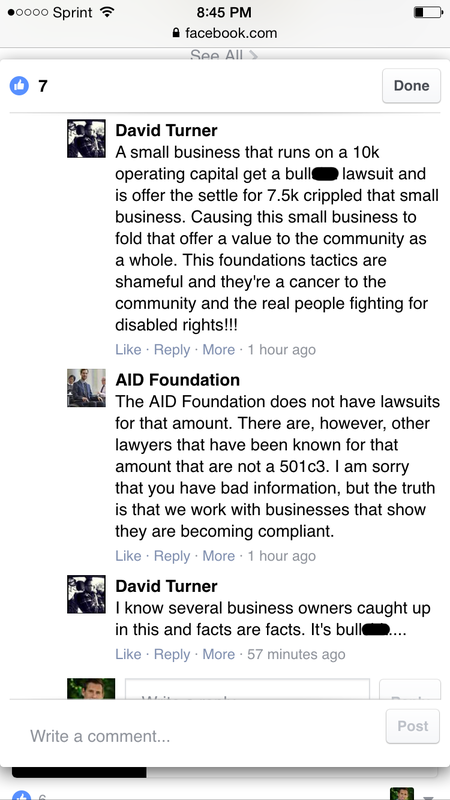 On their Facebook page, people who said they own businesses or know owners have challenged AID about their denial of settlement demands. Some of those posts were deleted from AID’s page. But ABC15 captured the screen grab below of one person’s statement and AID’s response. AID’s settlement demand letters have been filed in open court records for some lawsuits, showing a common demand is $7500 (See one example of an AID settlement letter further down this page and another here ). ABC15 also interviewed businesses who are currently negotiating with AID. Deanna and Morris France own and operate Extra Innings, an indoor baseball facility in Mesa. Their business was sued in early June without notice. France said she was surprised because city inspectors signed off on their building and parking lot when they opened three years ago. Even more confusing, her business had more accessible parking spaces than required, she said. So why did AID sue? There were issues with the signs. France said a few signs were too low and a pair of her larger accessible spaces was missing a van-accessible notice. France did fix and adjust her business’s signs. Their attorney then received a letter on August 3rd from AID’s lead attorney, Peter Strojnik. France said she offered $1,000 to close out the case. On August 10, she received another letter in return. Deanna France said she doesn’t believe they offered $500 and isn’t sure why that was written in response. Note: See both AID settlement letters below. France said the whole experience has been frustrating. France’s sentiments match those of many other businesses interviewed by ABC15. “I really felt like I was haggling for a car or something,” said Steve Fisher, who owns an auto repair shop sued in early June. Fisher said defending his business, Doug’s Bugs, against a lawsuit and negotiating with AID has been difficult. He said that spot is his mother-in-law’s unofficial spot. After Fisher said he corrected the issues, he had his attorney offer $1,500 to settle. AID didn’t accept, he said. Fisher said his experience speaks volumes.